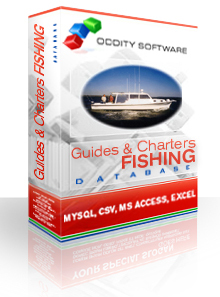 Fishing Guides and Charters Database. 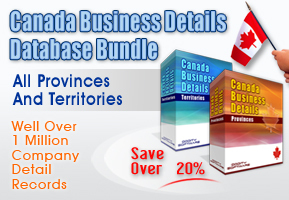 All Business databases, content databases and lists available for instant download. Database download formats include MySQL, MS Access, CSV, and other Delimited Formats. This Database is updated every 120 Days. Master License holders can purchse updates for this database for $2.50. Fishing Guides and charters database covering the United States. Also some listings for Hunting & Fishing Preserves as well where applicable. Whether you're a weekend fishing enthusiast or a championship deep-sea fisher, you will find it helpful to have a centralized database of all things related to fishing. An up-to-date, well-organized fishing database is a godsend for the modern fishing aficionado of any level who simply doesn't have the time to waste running around all over town to find say a tackle or bait shop only to find that the shop doesn't sell what they're looking for. Think of a fishing guide and charter database as an online yellow pages telephone directory; they don't actually sell any products but they do host a list of business establishments that do, businesses that provide services or products related to the fishing industry. Maybe you're looking for a special type of tackle or perhaps a professional fishing rod model; in these cases, a comprehensive fishing database can be a lifesaver. But it doesn't end there; these online fishing databases aren't limited to stores that provide fishing supplies. Many business that offer fishing tours and chartered fishing trips are also listed in these online databases. This is the perfect way to find just the right fishing expedition package for you and your family or friends. These databases are also a big help when you go out of town on business and just can't resist the urge for a quick afternoon fishing trip but don't know where the local fishing spots are.